Twenty-first century Shanghai’s skyline is the showpiece of the city. 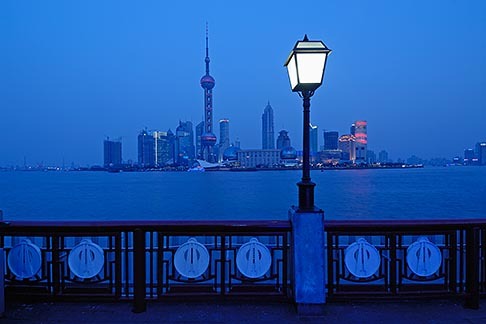 The modern Pudong District, with the distinctive needle and ball of the Oriental Pearl Tower and the soaring steel and concrete of the Jin Mao Tower, sits on a bend in the Huang Po RIver opposite the Bund, Shanghai‘s former business and financial center. Finding a time and place without throngs of tourists was not easy. In the late hours of dusk, the Art Deco railing and lamp of the foreground pedestrian walkway contrast with the distant sky, water and towers, China’s future. Impressive, what lens did you use? And when did you take this? I was just there and the Bund is all barricaded off for renovation, right exactly where you stood. You certainly make a point about shooting an everyday scene with an unusual perspective. I paired Shanghai acrobat stills to compliment Shanghai architectural images during my first visit/shoot of that incredible place! See http://miraterra.blogspot.com/2006/05/shanghaid… for my take on that amazing city. David Ogilvy in his book on advertising always pushed for the best arena for readers to get the message as easily and as quickly as possible. He absolutely was against negative type on a dark background, almost always black on white and not italics. He was also known for the “Ogilvy design” in his ads for his clients, the large photo on top filling the page, caption and two or three short columns of description. Worked then, works now. My main website would be heavily criticized by him, but my blog is like yours today. That's particularly true on the Bund in Shanghai where everyone turns out en masse, locals and tourists. I takes lots of patience. This shot benefitted from a misty rain, plus tungsten white balance. Beautiful shot David. Getting a photo in China with no one in the frame must be quite the challenge.